Home » Fitness Advice » What are the best trainers to wear? This is probably the second most asked question I have had over the years of being an instructor. The first being “How do I lose this belly?” (I’ll answer that another time as there isn’t a simple answer). Through the years I have worn many brands of foot wear and been affiliated with different sports wear providers. 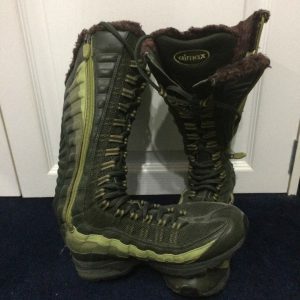 I have tried different types of training shoes designed for different sports and this is just my experience of foot wear and what I have found works for me. 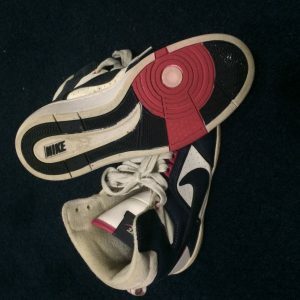 What type of trainer should i get? When it comes to types of trainers designed for different sports one of the things that I have learnt over the years is that the soles of the shoes are definitely designed for different things. The original waffle iron tread from NIKE was made from pouring rubber on a waffle iron (hence the name) and was majorly designed as a running trainer. I expect there has been as much money spent on developing treads of trainers as there has developing tyre treads for cars. From our point of view we can break them down in to two types tread. 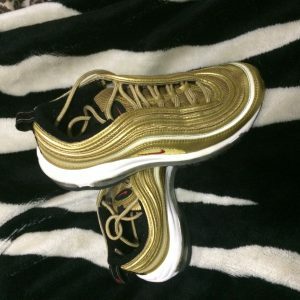 What is the best sole for me? Those designed to move forwards and keep the foot stable and those designed to turn or pivot quickly. When looking at these shoes they are quite easy to make out when you look at the sole. The reasons for each type are quite simple and logical. Trainers that are designed to turn quickly usually have some sort of pivot point near the ball of the foot. This is easily spotted as it is usually a circle moulded in to the sole, sometimes a different colour and texture of rubber. These have been designed for sports like basketball, tennis and squash. These types are often adopted by Dancers because the pivot point allows them to turn with small amounts of friction. 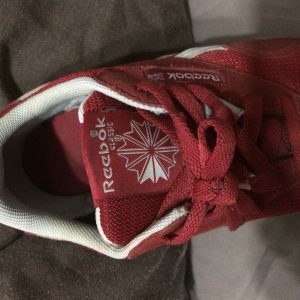 In my experience both NIKE™ and Reebok™ have dabbled in making dance trainers both have pivot points from the NIKE™ high tops to the Reebok™ Hyasu. If you are big into your dance based programmes from LES MILLS™ programmes like BODYJAM™ and SHBAM™ or Beachbody™ CIZE™ to any number of other programmes like ZUMBA™ or CLUBBERSIZE™ then this is the type of sole that you want to be looking at for your training shoe. It will allow you to twist and turn to your hearts contents with out an overly large amount of friction on the floor. This will save extra stress on your knees as you spin. Although you still have to lift your weight every time you do. The running tread is great for Aerobics and HIIT as it has a forward pointing tread. This is much like the tread on a car tyre. It is designed to keep the foot stable as it moves forward and if in wet conditions to dissipate the water out from under the sole. If you are after a running trainer to go running or there are numerous shoes that are designed specifically for this.. There are even shops that can put you on a tread mill and work out which shoe is best for the way your foot strikes as you hit the ground. 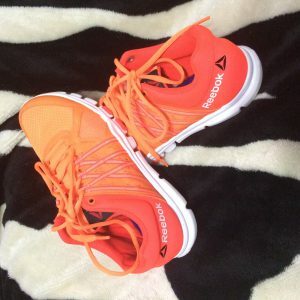 When looking for a shoe for aerobics or HIIT I have tended to use a running or cross trainer as they have a forward facing tread that keeps the foot stable. I generally try them on and feel what the soles are like. Some running shoes are loaded at the rear for things like road running. So they have more cushioning on the heel of the foot due to the strike of the foot from the heel to the front. But when we run or march on the spot in aerobics classes like BODYATTACK™ BODYCOMBAT™ BODYVIVE™ or in HIIT class like INSANITY™ or GRIT™ the foot strikes the floor in a different way. It lands at the toe first and the travels backwards towards the heel. Because of this I look for a trainer that I feel has cushioning at both the front and back of the foot. This helps absorb the impact in what ever direction I am running or jumping. To be honest I do not have much experience with heavy weight training other than classes like BODYPUMP™ and what I may train myself in the gym and PT clients for general fitness and weight loss. I am by no means an Olympic weight lifter nor is it my forte. But this would be my advice on a trainer for the lighter end of the spectrum as a beginner. When you are weight training you definitely want a stable base to perform on. 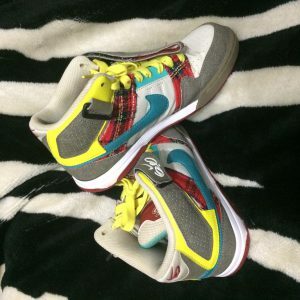 Some trainers have a higher heel than the toe, these are usually running trainers. 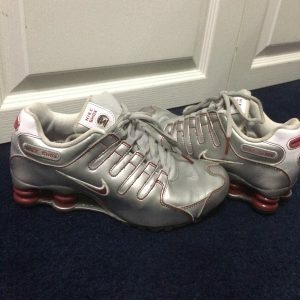 This was most noticeable a few years ago when NIKE™ had their SHOX trainers with the springs in the back. This can become a problem when it comes to things like squats and lunges for some people as the elevated angle of the foot changes the alignment of the bones in the shin. Now I’m not going to get into the form of a perfect squat as it is a mine field in biomechanics alignment. Most instructors will agree that the angle of the shin bones should be parallel to the angle of the spine from the hip to shoulder in a side view. If the heel is lifted it can have effects on this angle. Being logical I wouldn’t want to lift weights in high heels, nor move from my natural angle, in order to get the most out of the training and not to drop them on myself. Can I train in bare feet? In this day and age you will here the answer “No” Thanks to health and safety ideals it always seems a good idea to train in shoes. But there is no reason you can’t train with out them. Our bodies are designed to work with out them. We invented shoes for what ever reason whether it was to protect from the weather, temperature or objects on the floor. 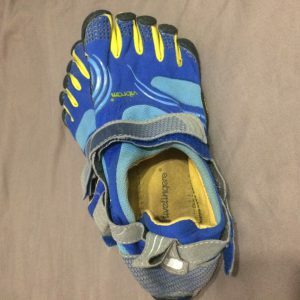 You have probably noticed the rise in barefoot like training shoes from Vibram™ and their five finger shoes with the toes in to their furoshiki wrap around soles. 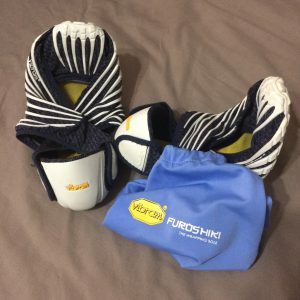 There are also almost indestructible socks that allow you to get even closer to barefoot training with out damaging your feet on sharp objects. Some people will say that what if you drop a weight. I’m not sure that trainers will actually save you from much as they aren’t steal toe capped and I expect you would be a bit more careful in bare feet, although there is no accounting for other people. In my experience they only last about 100 hours of impact work, then the soles seem to start loosing their cushioning. 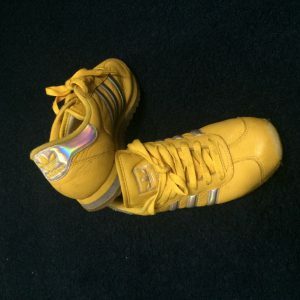 I have my trainers for training and I use my old ones for walking around. If you train in a gym or a studio you should have a pair just for training because they last longer and they stay clean so you aren’t walking any dirt or mess in to the spot you maybe about to get on the floor and do a press up in. If you run outside you should definitely have a pair just for that. One thing I hate as an instructor and think is rude is people wearing dirty shoes in a class or for a PT session. Its not just messy for you but for everyone around you and it plays hell with any OCD I have. 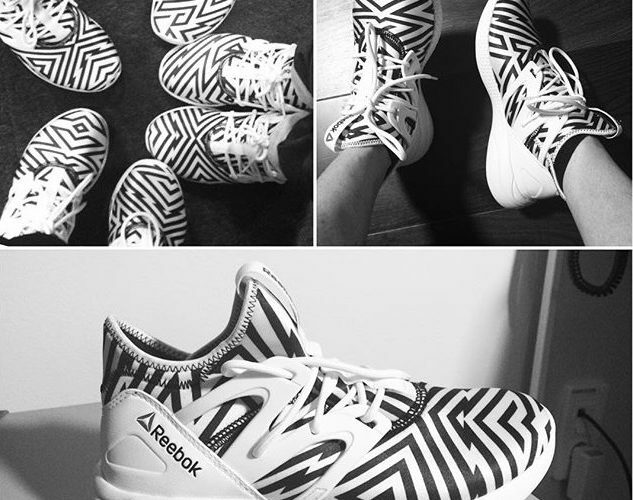 The other things that I would consider are how wide your feet are Reebok™ generally have a wider shoe than NIKE™. SKETCHERS™ seem to have a looser fit and come up almost a size bigger in my experience although have memory foam in the sole which is a very comfortable wear. A number of trainers now have memory foam under the foot although this is amazingly comfortable we all have different size insteps or arches of our feet and some of us need more support than others when it comes to training. In this blog I have tried to give you as much unbiased information as possible as I guess I feel you have to choose which ones are the best for you after taking in all these considerations. The shoe that fits and is comfortable is the best one. In saying that I do have different makes and styles for different classes. In fact every picture here is a pair of my shoes! Being a pilates instructor I also train in socks and bare feet depending on what I feel is the best for the results I am after. 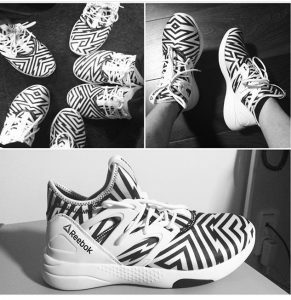 The greatest thing about trainer is going to buy them! So happy shopping!